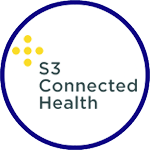 S3 Connected Health design and develop digital therapeutics, connected patient care solutions and clinical decision support software. We personalize support and interventions to enable better clinical care, empower patient self-management and improve healthcare outcomes. Experts in the development of SaMD (Software as a Medical Device), we are committed to delivering solutions that are clinically validated, capture real-world data, provide improvements in healthcare outcomes, are scalable and adhere to the highest regulatory standards.